A large and roundheaded forest owl, this species has an unmistakable face pattern that accounts for its name. 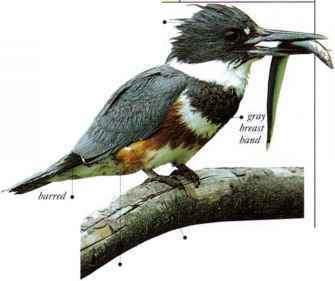 Even more striking is the white-bodied juvenile bird, with its black face-mask. The species lives in such habitats as thick rain forest, open woodland, and riverside bands of trees, but it is nocturnal and rarely seen. Its most typical call is a series of rapid, low pitched hoots. The Spectacled Owl roosts by day on a branch and hunts at night, being most active on moonlit nights. Frey includes insects, tree frogs, birds, mammals, and, in mangrove forest, crabs. • DISTRIBUTION From Mexico south as far as N. Argentina, Paraguay, and S. Brazil.